Sharp has launched new display products for the digital signage, education, and collaboration markets. Sharp has unveiled new products and solutions at Integrated Systems Europe (ISE), including three new 4K professional displays for digital signage, a 4K interactive Windows collaboration display, developed in partnership with Microsoft, two new 4K BIG PAD interactive displays, and a second generation 8K monitor. In three areas of the stand (Hall 12 / E100) dedicated to showing smart solutions for the retail environment (Engage), for education (Learn) and for offices, (Working together), Sharp and its partners invite visitors to experience how Sharp technology can transform the ways that we engage with information. A fourth area (Innovate) shows Sharp’s leadership in Ultra-HD with future-looking technology including Sharp’s 8K ecosystem for creating and displaying 8K content and an immersive VR demonstration for retailers. Sharp launched its first Windows collaboration display (WCD) at ISE, the next generation of interactive displays designed to support and improve team work. The 70” 4K display meets Microsoft WCD specifications, combining Sharp’s award-winning touch technology with sensors for a smarter workspace. Sharp also launched its latest BIG PAD for the corporate environment. The TH1 range of 85”, 75” and 65” 4K Ultra HD (3840 x 2160) interactive displays offers 20-point touch and features the latest InGlass interactive technology for a highly responsive Pen-on-Paper experience. An integrated Android PC includes a whiteboard application and makes it easy to connect wirelessly to other devices. 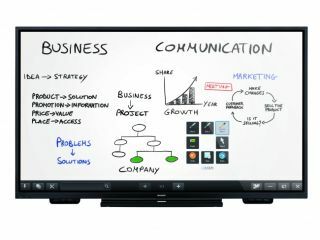 Sharp also demonstrated interactive solutions for every stage of education, from an early learning table for nursery aged children, up to Sharp’s latest interactive BIG PAD for lectures in universities and at corporate training centres (the PN-70HC1E). The BIG PAD HC1 range offers a choice of 70”, 75” and 86” 4K Ultra HD (3840 x 2160) displays with a range of connection options, including USB, HDMI and wireless. The 4K resolution and Sharp touch technology enables high resolution reading and highly responsive Pen-on-Paper writing in fine detail. This area is dedicated to Sharp’s new products for applications that create an engaging world of content. Sharp has added 12 new 4K Ultra-HD displays to its line-up in 2019, across three families, the PN-HM, PN-HB and PN-HW. Sharp’s software partner Videro runs a live demonstration of its software ecosystem on the new PN HB/HM models, showing how content and displays can be controlled via mobile devices. The PN-HB and PN-HM models are large format, in three sizes from 65” to 85”. They can be installed in portrait or landscape and face-up and can run many different partner applications via an embedded Android 7.1 SoC and a Mini-OPS extension slot. Sharp’s PN-HW professional displays offers six screen sizes, from 43” to 86” and a built-in USB media player. In its innovation area, Sharp showcased its 8K ecosystem, including a demonstration of its 8K professional camcorder and new 8K display. The 8C-B60A 8K (60p) professional camcorder integrates capabilities for video shooting and recording, playback, and line output. The output from the camera will be shown on an 80” 8K monitor, 8M-B80AX1E, Sharp’s second generation 8K display, which offers exceptional picture quality. Sharp is also exhibiting a model of its compact 8K video camera, currently in development. The camera is planned to feature a Micro Four Thirds mount and a CMOS sensor capable of delivering 8K resolution at 30 fps using the H.265 codec.